When the summer weather finally starts to fade, and the crisp air brings the changing of the seasons, one thing is for sure – fall is finally here and the holiday season has begun. First up? Halloween and two of our favorite things: costumes and candy. Whether you decide to get decked up and go all out for Halloween or want to keep it simple with your favorite scary movies at home, there's no denying the allure of some of our favorite and most nostalgic Halloween candies. Of course, some of these candies can be a bit more controversial than others. While some are near-favorites by default, others are virtually dreaded and disgusted. You might know how you feel about Reese's Peanut Butter Cups, Snickers, and Butterfinger – but what about candy corn, licorice, or Raisinets? We surveyed over 2,000 Americans to see which were their favorites, and which ones they wouldn't touch with a 7-foot broomstick. Continue reading to see what people from your state had to say. In almost two-thirds of the country, the award for the worst Halloween candy came down to one of two choices: candy corn and licorice. It's hard to know which one kids most hate finding in their bags after a long night of trick-or-treating, or which is most likely to show up on the clearance rack come Nov. 1 – but these two were a fairly safe bet. In 21 states (including California, Georgia, and Maryland), candy corn came out on top as the most dreaded of all Halloween candy options. While there may be some debate online among a few candy corn loyalists, the reality is that these notorious orange, white, and yellow corn kernels aren't inspiring a lot of love among most Americans. 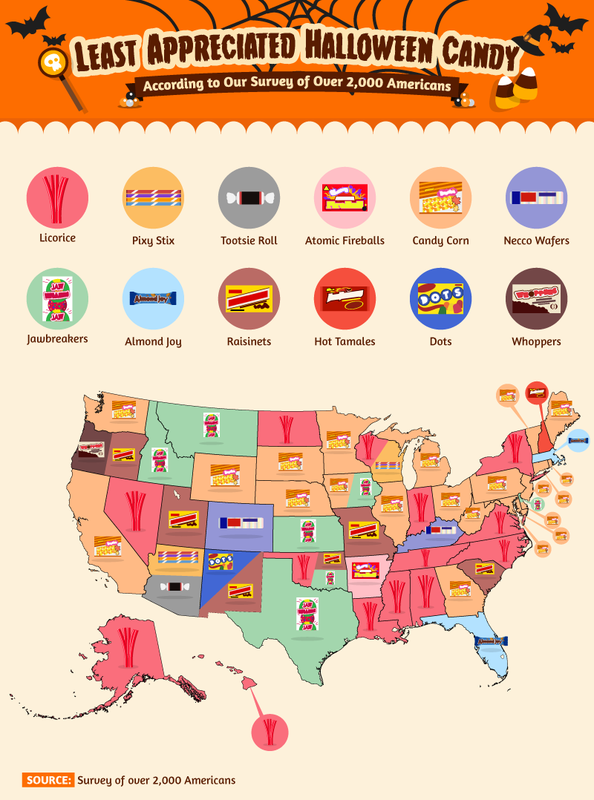 In 13 states (including Alabama, New York, and Nevada), licorice took the top spot as the worst candy option around. As it turns out, there may be a bit of science behind the hatred some people feel toward licorice. In the same way that people either love or hate cilantro, research suggests an aversion to licorice could be instilled into our very DNA. Of course, if it's the smell of licorice that puts you off, that's a learned preference and means you're among the many Americans who simply dislike it. Other outliers that ranked among the least favorite candy options? Almond Joy, jawbreakers, Raisinets, Pixy Stix, Tootsie Rolls, Hot Tamales, and Necco Wafers. Now that we've gotten the nasty stuff out of the way, let's turn our attention to the best of the best when it comes to Halloween treats. The candy for which giving out full-size bars might make you a Halloween legend on your block. 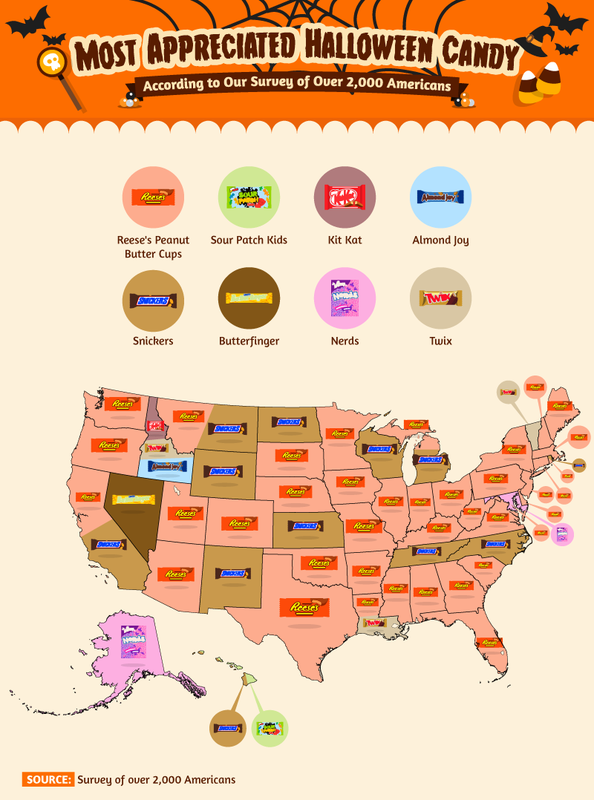 The absolute favorite Halloween candy, according to Americans in 38 states (including Washington, D.C.)? Reese's Peanut Butter Cups. Available in a number of options, including holiday shapes (like a pumpkin, Christmas tree, or Easter egg), spreads, cakes, and even burger toppings, there's no denying Americans love their Reese's. Thankfully, all that creamy, delicious peanut butter actually makes them a fairly good source of protein, even if they shouldn't exactly be a staple in your diet. Second place might also be the same as first loser, but in 12 states (including a tie in California, Michigan, and Rhode Island), Snickers was actually the favorite overall. The proof could be in the sales because Snickers bars outsold Reese's around the world in 2017. Those delicious layers of peanuts, caramel, and nougat all wrapped in milk chocolate can be hard to resist, so Halloween might just be the perfect time to indulge. It would be hard to dethrone these two Halloween candy kings, but Almond Joy, Kit Kat, Twix, Nerds, Sour Patch Kids, and Butterfinger all managed to rank in a few states as people's all-time favorites. In the battle between the best and worst Halloween candy, nearly all of the top-favorites across the U.S. had one thing in common: chocolate. Chocolate may occasionally get a bad reputation, but studies have linked it to lowering cholesterol levels, preventing cognitive decline (including memory loss), and reducing the risk for cardiovascular problems. Its potential health benefits could be a bonus, but they don't exactly explain why Americans love chocolate so much. Scientifically speaking, chocolate can help us feel happier by releasing dopamine (the feel-good chemical) in the brain. In addition to triggering the receptors that make us feel good, dopamine can even help relieve stress –helping explain why Americans might enjoy it so much. Nearly 1 in 5 Americans agreed – Reese's was the all-time best Halloween candy on our list. Following this, Snickers, Kit Kat, and Twix landed the top spots for chocolaty goodness. And the worst candy? Candy corn, licorice, and jawbreakers. Even though Americans agreed on the Halloween candy they loved most, they had slightly different opinions on which were the worst. Today, Halloween and candy go together like Thanksgiving and turkey or Christmas and pine trees – but that wasn't always the case. Trick-or-treating didn't really exist until the 1930s and wasn't really popular until the '40s and '50s. Until the 1950s, it wasn't uncommon to find nuts, cereal, or even homemade cakes in a Halloween basket. Even though the first Reese's (called "penny cups") were sold in 1928, and Snickers bars hit shelves just two years later in 1930, plenty of candies were popular years ago that you might not have heard of today (like Cherry Mash). 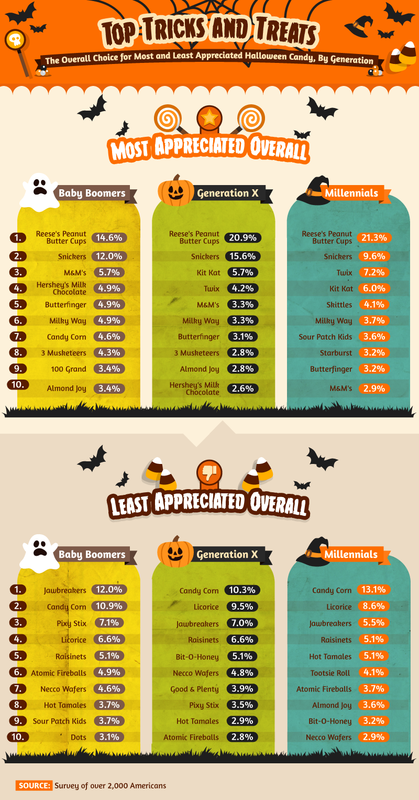 Baby boomers, Gen Xers, and millennials all agreed Reese's was the best Halloween candy, but baby boomers had a different opinion on which candy took the top slot for worst overall. While Gen Xers and millennials ranked candy corn as their least favorite, baby boomers gave that honor to jawbreakers. Even though some of the best and worst Halloween candies could easily be referred to as classics, new candies and candy flavors are hitting the market all the time. Like the new caramel M&M's, hazelnut-flavored Snickers bars, and "Sweet Heat" Skittles coming out in 2017, even your favorites get a fresh new flavor and look now and then. Not all flavors are destined to be a hit, though. 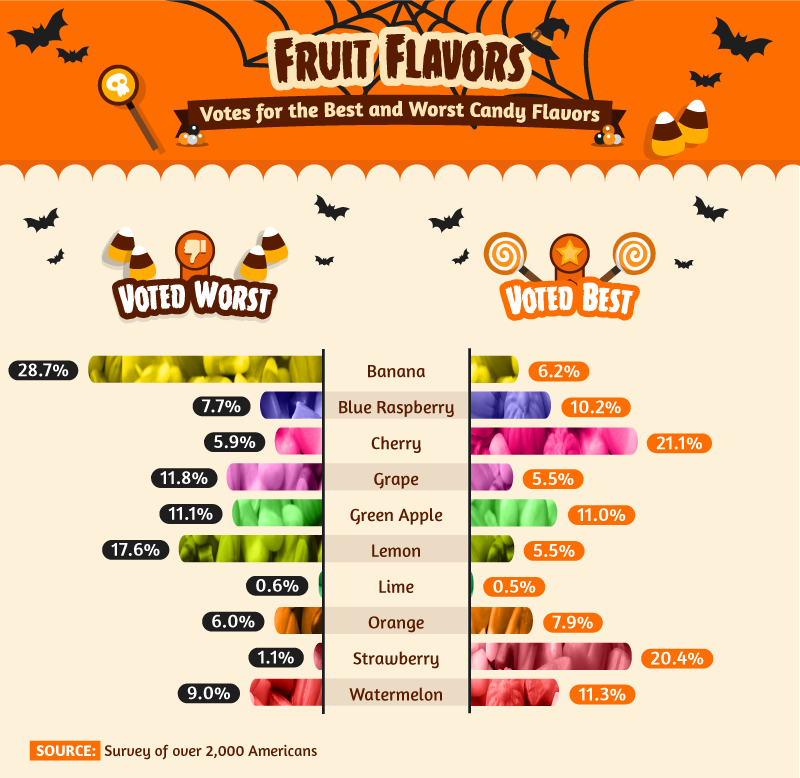 Nearly 29 percent of Americans said banana-flavored candy was the worst, followed by lemon and grape. But not every candy has to be chocolate to be delicious, according to the people polled. Roughly 1 in 5 said they loved strawberry-flavored candy (pink Starburst, anyone? ), while slightly more said cherry was the best hands down. We asked Americans across the country to describe the most celebrated and disgusting Halloween candies – the revered Reese's Peanut Butter Cups and condemnable candy corn. People we polled didn't mince words when giving us their two cents on what it's like to actually eat candy corn. Besides "sugar" (the number one ingredient listed in candy corn), Americans called out the words "flavor," "eat," and "gross" which might tell us everything we need to know about what makes candy corn so reviled. Other common callouts included "wax," "texture," and "never." On the other end of the Halloween candy spectrum, people described eating a Reese's with words like "chocolate," "best," "peanut," and "taste." Peanut butter and jelly should probably move over – the "flavor" and "texture" of peanut butter and chocolate could be America's favorite peanut butter combination. When it comes to kicking off the fall holiday season, Halloween gets first dibs. When the autumn weather starts to settle in, you know costumes and candy are on the horizon. If you're thinking about stocking up for your local trick-or-treaters, keep these tips in mind: Chocolate-based candy will generally go over better than anything else, and Reese's and Snickers are bound to be a smash hit. If you see a sale on candy corn – there's probably a good reason why. And if you're still on the fence for some reason, perhaps consider dressing up as candy corn rather than passing it out. If you're looking to complete the rest of your Halloween necessities, Halloween Express has everything you need. From the best in costumes and accessories for kids and adults alike to all of the props, decor, and party supplies you'll need to throw the perfect Halloween celebration. Shop online today or find a local Halloween Express near you today. We surveyed over 2,000 Americans about their Halloween candy preferences. For statewide data, all states had a minimum sample size of 11 survey respondents. Want to treat others with the findings on this page? Feel free to share the images and content here for noncommercial purposes. Just don't pull any tricks when doing so and provide a link back to this page, so the authors receive proper credit.